RJ11 6P4C Single Wall Plate Jacks. Mounting Screws included. Ivory or White color housing. Contact Plating: Gold. RJ11 6P4C Double Wall Plate Jacks. Mounting Screws included. White color housing. Contact Plating: Gold. RJ12 6P6C Single Wall Plate Jacks. Mounting Screws included. Ivory or White color housing. Contact Plating: Gold. RJ12 6P6C Double Wall Plate Jacks. Mounting Screws included. Ivory or White color housing. Contact Plating: Gold. Mounting Screws included. White color housing. Contact Plating: Gold. 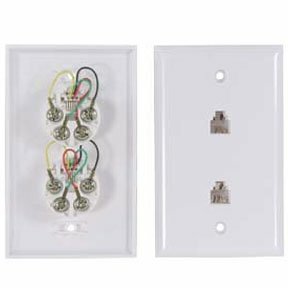 You can order modular wall plates to facilitate your telephone connections at home or at office premises. We have an array of products in this category. You can choose from RJ11 6P4C Single Wall Plate Jacks, RJ11 6P4C Double Wall Plate Jacks, RJ12 6P6C Single Wall Plate Jacks, RJ12 6P6C Double Wall Plate Jacks, and RJ45 8P8C Keyed Single Wall Plate with Screw Terminal available in different colors. All the products are quality checked and safety ensured as compliant to RoHS standards. We offer competitive prices by cutting of middlemen costs. At SF Cable, you get good after sales service along with lifetime technical support on all products.